The Hummanaya Blow holl [sic] in Kudawella, Sri Lanka, is reputed the second largest blow hole in the world, whether or not that's true, it does make a nice site to visit! The blow hole is a small triangular shaped underwater cave between cliffs. Wave action on the open sea is mirrored within the cave and water & air is forced up into the narrow pipe and blown out the opening at the top. If conditions are right, these blow-outs are spectacular, blowing water up to 25m –some sources even claim 30m– high in the air. Less favourable conditions also mean less impressive blows; which unfortunately was the case when I visited the site. The best time to visit for great blow-outs is during the South Monsoon and in particularly June, with strong winds blowing from the south-east creating large waves and pushing the water high up the coast and into the cave. The name 'Hummanaya' (or Hoo-manaya) refers to the sound escaping air from the blow hole makes: a low rumbling hoo-sound, which can be heard some distance away. 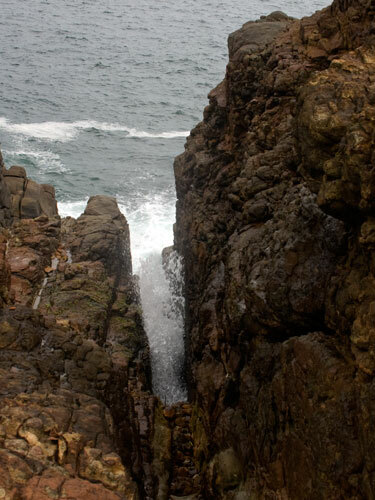 A blow hole is formed by wave action starting to erode a weakness in the coastal rocks (1), forming a crack or cave. Following the weakness in the rock, the cave expands (2) and grows land inwards and upwards into a vertical shaft exposed at the surface (3), where the wave action becomes visible as blow-outs (4). The force of the waves compresses air pockets in small cracks in the rock, which upon withdrawal of the water expand rapidly causing the rock to crack further and eventually break. Caused by waves bashing sea load (rocks, pebbles, sand, etc) into the cliff. The sea load dislodges loose and weak rock. Rock, particularly limestone –which largely is composed of calcium-carbonate, is dissolved by acids in the seawater. Wave action causes loose rock debris to collide with each other, resulting in smaller and rounder particles, which in turn have a sandpapering effect on the rest of the rock. Apart from shoreline erosion, blow holes can also be formed through biological and volcanic processes or even by human activity, however, those are not relevant for the Kudawella area. The Hummanaya Blow Hole is located on an island connected to the mainland by a tombolo [ ]: a deposition land form connecting an island to the mainland by a strip of deposited material (sand or gravel). Due to the densely packed residential area, the tombolo isn't visible while walking to the blow hole, but can be seen clearly from the air. The island where the blow hole is located, is part of the so-called Highland Series [ ], which is a range of similar –both in age and composition– rock and runs roughly from the North-East of Sri Lanka to the South. This series is mainly composed of feldspar and quartz rich rock-types like schists & gneiss, granite, quartz-feldspar granulite, etc. 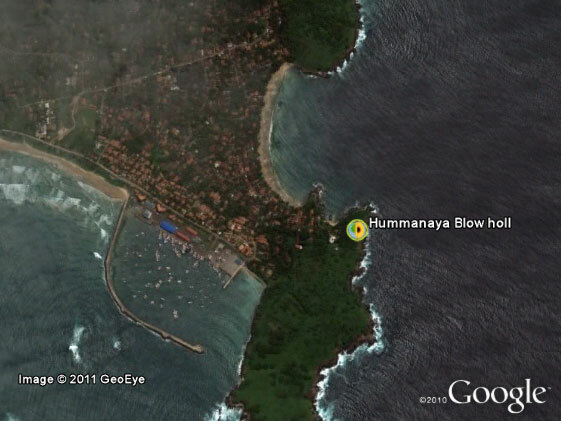 The Hummanaya Blow Hole is a protected site in Sri Lanka. 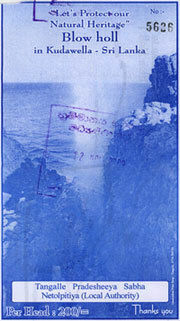 The admission fee is LK 200,- (± USD 1,75/EUR 1,20) per person. You need to climb a number of stairs to get to the blow hole, which makes the site inaccessible for wheelchair users. Food, drinks and souvenirs are available when walking to the blow hole. Getting there by car is fairly easy: follow the main roads in and through Kudawella and when you get to within a few hundred meters of the blow hole, look for a parking place; numerous opportunities are offered by the locals. From where you parked the car, keep following the main road towards the path to the blow hole (TH2YM5X waypoint), from there signs show the way. You may log the Hummanaya Blow Hole earthcache immediately after visiting, but I will require the answers to the questions below within a reasonable time frame. 1. Of the four mentioned erosional processes, which is least likely to have contributed to the creation of the Hummanaya Blow Hole and why? 2. Describe the colour, shape and texture of the rock surrounding the blow hole (the area where you are standing just outside the fence). 3. What are the most likely causes of the smooth texture of the rock near the fence (on the side where you are standing)? I'm looking for two answers. One is natural and the other is not. 4. [Optional] Estimate the height of the blow-out and add to your log.